Wow, that was a good Eddington Astronomy Society of Kendal observing session – probably 15 people learning about the night sky from Simon and looking through several different telescopes with different capabilities. Sky got hazy about 21:30, so we packed up. I must admit, the pint in the New Union, only a few minutes from home, afterwards was excellent. Lots of Messier objects, i.e. faint fuzzies, seen through my 8″ scope – M42, the Leo Triplet of galaxies M65, M66 and NGC 3628 in the same visual field – nice to see them naked eye after imaging them last Monday night – M51, M101 [both difficult] and the spectacular doublet of M81 and M82. The star of the night must be Jupiter which was spectacular – all 4 moons put on a show although two were being rather shy and hiding. I managed to connect a webcam – Philips SPC900NC – and demonstrate video image capture. The stacked image [Registax] is much better than I expected – probably because I tweaked the scope collimation on Monday night. Pleased with that. 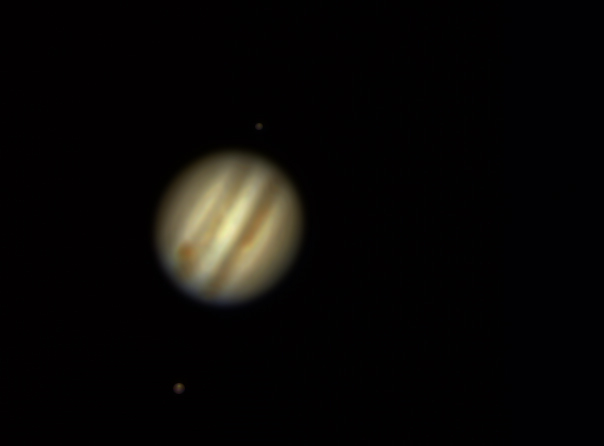 Couldn’t see the Great Red Spot trough the eyepiece but it is clearly there in the processed image. 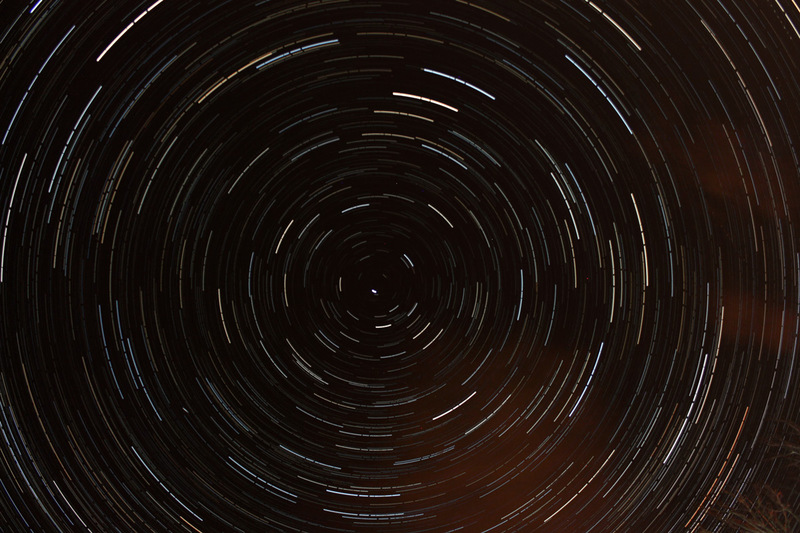 Polaris from a static camera on a tripod – series of 15second images spaced by 15 seconds over 90 minutes. I also pointed a camera at the Pole Star and captured a series of 144 15 second exposures with 15 second gaps between them over approximately 90 minutes. I removed images with aircraft in them or light from torches of people wandering about! The remaining images I combined using the free Startrails software http://startrails.de/. There is an interesting object occurred about 19:14 which may be a satellite flaring or a meteor at approximately ‘7 oclock’ on the image. No Iridium flares were predicted around that time. This entry was posted in General by Ian Bradley. Bookmark the permalink. Grand night clearing just in time. Thank you for turning out with your telescope Ian, and for running the Messier hunt again. It was very pleasing that so many came along for the second month in a row. I arrived at the car park before 7.30 to assemble my kit before the scheduled start at 8pm, only to find three EAS members already there and two telescopes up and running! The forecast was spot on and we had clear skies for nearly the whole session, with just a couple of small patches drifting over during the evening. The centre of M42 at high magnification was my favourite target, with wisps of nebulosity clearly visible as a background canvas to the Trapezium asterism – four stars in the heart of the nebula. I think every telescope pointed there at one time or another during the session. Jupiter was much higher in the sky than last month, and we had fantastic views of the belts in the atmosphere, along with three moons moving along their orbits. This will be remembered as the session we all watched “Europa rising”. My tally came to 23 stars in Orion, which is pretty good considering that one or two cars were still arriving with headlights on. This technique might prove useful for comparing observing locations – although Orion isn’t in the sky all the year round.